Kayla Williams began taking gymnastics classes when she was five years old. She says her favorite event depends on the day, but usually it is the beam. The 17-year-old from Huntington, W.Va., trains in with the Cincinnati (Ohio) Gymnastics Academy. Williams is a teammate of Nastia Liukin Supergirl Cup qualifier Amelia Hundley. The two are close friends, constantly pushing and encouraging one another. She trains five hours per day. Williams considers her greatest strength to be her power. She says she is not a graceful gymnast, but a powerful one. Overcoming injuries has been her greatest challenge in recent years, but she has persevered and was all-around champion at the 2009 Junior Olympic Nationals. 2009 was a breakout year for Williams. Following her Junior Olympic success, she moved up to elite and finished fifth in the all-around at the CoverGirl Classic and seventh at the Visa Championships. 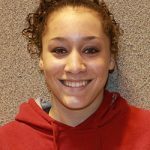 She also won the U.S. vault title at the Visa Championships and went on to win the vault title at the 2009 World Championships. She became the first U.S. woman to win a world vault gold medal. In 2010, she returned to Level 10 competition. Williams spends her free time reading and catching up on her sleep. She plans to go to the University of Alabama and compete with their gymnastics team.